The lady is seen here in this tapestry showing the sense of sight. Here she holds an ornate mirror to show the reflection of the unicorn's face who is endearing and placing his hoofs onto her lap. This is a detail taken from the larger work celebrating the sense of vision or sight. 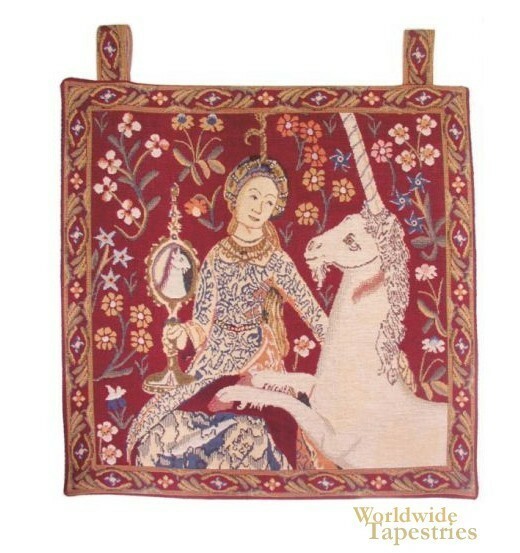 This unicorn art tapestry "Sight (La Vue) Detail - with loops" is backed with lining and has loops for easy hanging. Dimensions: W 19" x H 19"